Happy Monday everybody! I hope your weekend and Mother’s Day were both amazing! Now that I’ve had a few days to recover and catch up from my New York trip, I’m back to my normal schedule at home. Not for long though! This weekend I’m heading to my friend Jenny’s wedding in Nashville. It’s been nearly ten years since I was last in Tennessee, so I’m looking forward to reacquainting myself with the country music capital of the world. While I don’t have a ton of free time, I will have time to grab dinner on Thursday night – do y’all have any recommendations?? Let me know! Now to today’s outfit… I wore this look for a few meetings in New York last week. This blazer is one I picked up right before the rewardStyle conference in April. The unique caramel color and the open-back style are initially what drew me in, but the fact that it was on sale sealed the deal. The fabric on this jacket is light, making it an ideal transitional piece from winter to spring and summer to fall. Definitely a piece I’ll be packing for London! 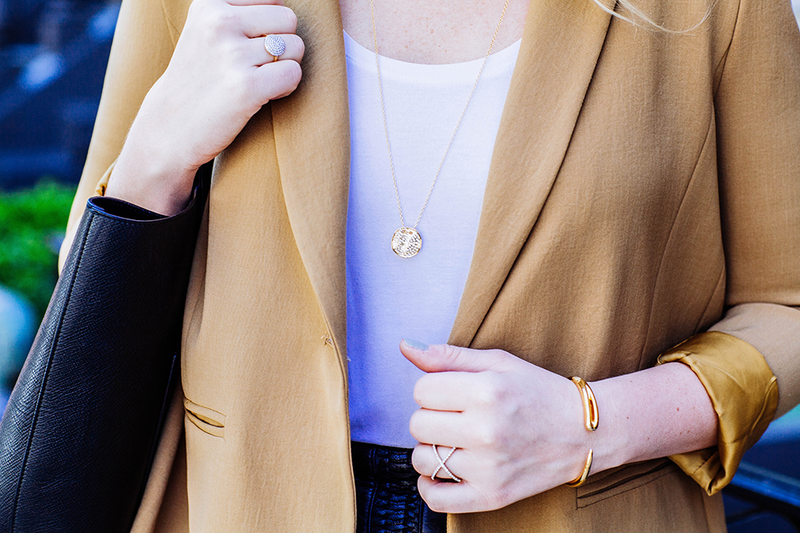 PS – if you wear a size 2, check out this blazer in cream. So gorgeous! One more thing… I’m still not completely sold on how I want the UK links to show up in my “SHOP THE POST” section in every blog post. I hope you’ll bear with me as I figure out the best way to incorporate these new links for my UK readers! If you have any questions or suggestions on how to make it easier for you to read, let me know! this blazer is so classy and has a little surprise on the back!love the outfit classy and simple! This blazer is stunning, love the back. Such a cool blazer! You look amazing! So chic and preppy! Great look Merritt! I really love that blazer, but your shoes are what caught my eye! amazing piece, that blazer is. Love the lines of your skirt too. You always look so polished & lady like. Love the texture of that skirt an love unexpected details, so that blazer is spot on! This is such a great look! Love the unexpected slit on your blazer. That blazer is incredible. The whole look is sophisticated and chic! Love the unexpected detail of your blazer. I’m so happy to hear from you! Are there retailers that you love that you’d like me to start featuring on here? I’ll do my best! Such a great look for NYC. You always look so chic and classy with a bit of edge, and this look is the perfect example. I love that blazer! I’m also jealous of all of your fun travels lately and have loved following along via IG and Snapchat! Your outfit is very much on fleek! I especially love those shoes. I thought you were in SF for a second there! I love the reverse look of the blazer! This blazer is so cool! I have never seen anything like it. Such a cool blazer! Love how you styled it! Such a unique take on the average blazer! Love it! So chic! I’m in love with this skirt! That blazer is amazing! Love the unexpected slit, such a great piece. Pretty blazer and I hope you have fun at the wedding! 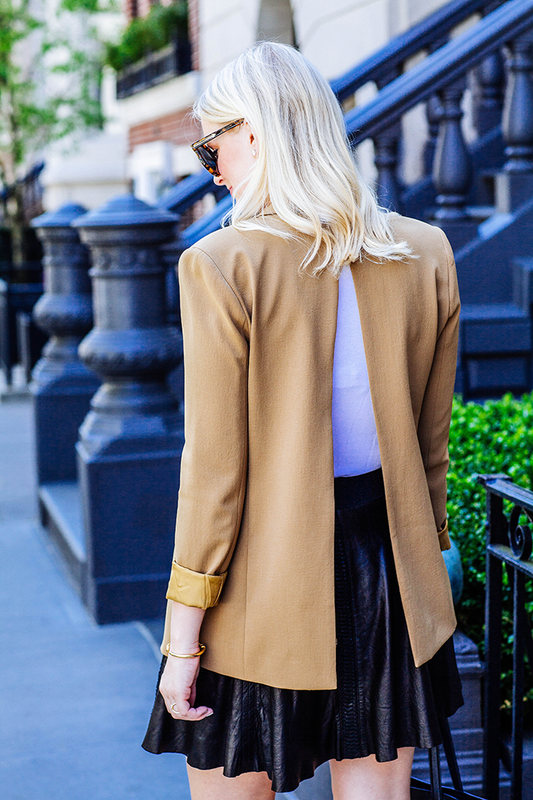 love the back of that blazer. Have fun in Nashville! Great ensemble! LIke the blazer!